Today was definitely my worst day with regards to overeating at Christmas. We were invited to a Christmas lunch potluck thing at friends. They are Polish, so they had quite a few Polish traditional meals on the buffet table, we added two salads, more salads came from other guests. The dessert was an oven baked apple filled with cinnamon, raisins and butter with some vanilla ice cream on top. After all that, I decided that it wouldn't make much of a difference if I also tried bits and pieces of lovely homemade Christmas cookies, coffee cakes etc. that other people brought. I am feeling a bit like a sausage now. The only thing that makes me feel a little less guilty is the fact that I squeezed in a 6 mile run before we went to the Christmas lunch. .............Bulgur and Walnut Kibbeh. 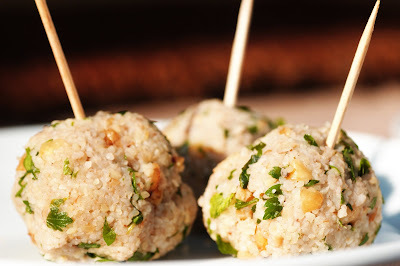 These balls originate from the Middle East and are usually made with bulgur and minced meat. I liked the combination of grains and nuts, as it is much lighter and the garlic and lemon taste comes out much better. I found this recipe in the NY Times, and tweaked it just a little bit. The original recipe calls for 2 garlic cloves. I would reduce that to one, as raw garlic tends to repeat on me for several hours after consumption which can be a little annoying. In my opinion, these balls also call for a little dip. I liked a tangy Tahini Soy dip, when other family members preferred a light and fresh tomato salsa dip. The kibbeh can be prepared well in advance and keeps well in the fridge for a couple of days. Place the bulgur in a bowl, add salt to taste and pour 1,5 cups of boiling water on top. Let sit for one hour, then drain and squeeze out excess water. Mince the garlic, add salt to taste. Then stir into the bulgur. Add the walnuts, olive oil, parsley, mint, pepper, cinnamon and the lemon juice. Moisten your hands and knead the mixture for a couple of minutes, then allow to sit for 15 to 30 minutes. With moistened fingers, form the bulgur mixture into bite-size balls. Serve immediately or keep in the fridge. For the dressing, combine all ingredients and mix until well combined. Add water to thin the mixture.